SHOULD FOLLOWER COUNT DETERMINE WORTH? It’s a question that depends on context. For regular everyday products like shoes, toasters, or books, the answer is a clear yes—more followers means your promotional dollar goes farther. But for “high art”—where value is supposedly determined by long-term aesthetic value more than short-term commercial ups and downs—the question becomes more complicated. A Dutch artist is playing with this line, and in the process reveals some uncomfortable truths about what’s behind some of those large follower counts. The next edition of the revolutionary podcast “Serial” will be running on Pandora. That means there should be many more ways to advertise on it than through a single sold-out sponsorship. They aren’t saying when the second season will start yet, but Pandora has announced that season one will be available for listening as of Nov 24. WILL LOUSY CREATIVE SPOIL INSTAGRAM FOR THE REST OF US? As Instagram opens up its API, some marketers are afraid of the coming wave of ads. Will a billion terrible ads ruin our sandbox? The answer, as always, is to make creative that’s the best fit for book, reader, and audience platform. File this under experiments to watch. Next to Now focuses on the near-future of marketing, but it’s worth remembering that our bread-and-butter work comes from selling books right now to readers who are buying them right now. And that means the Boomer generation. So it’s worth noting that Boomers are not as easily reached with mobile marketing as the Millennials. Only 42% of Boomers own a smartphone, and those that do own a smartphone do not live through it to the extent that younger generations do. Worth considering when you’re putting together a media plan. Next to Now: The End of Big Tent Marketing? This week, new data from Instagram, YouTube, NPR and more suggests that the shift away from big tent marketing—where all your customers will hear your message at one, pre-determined moment—is well underway. Time to set up lots and lots of individual tents. 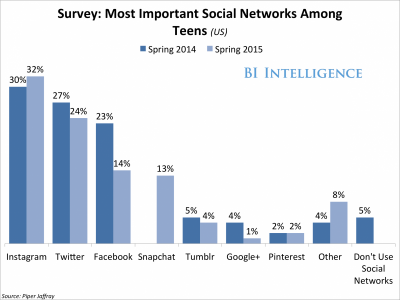 Instagram builds on its lead as the most important social network among U.S. teens. Instagram announces that it will open its network to everyone this fall. Rates, minimum spend, and other requirements have not yet been released to us at Verso, but as soon as we learn more we’ll let you know. This type of insight doesn’t easily map to book publishing, since every publisher is caring for hundreds to thousands of different brands (aka authors or series), but it’s undeniable that editors, marketers and publicists for every house are gaining public voices—and this is a good thing. On the subject of one-to-one advertising, this outdoor campaign for a Swiss vacation spot is brilliant at literally starting a conversation. YouTube viewing habits are going mobile: 50% (and growing) of YouTube views are mobile. TV viewing habits are changing: 28% of all TV watching is now streaming. In another sign that the NPR audience is beginning to shift from live listening to on-demand, NPR podcasts have nearly doubled in hours downloaded over the last year.